Love someone with allergies, food intolerances or dietary restrictions? This is a sweet treat that is free of the Big-8 allergens (dairy, eggs, fish, shellfish, tree nuts, peanuts, gluten and soy). Even those who eat all the above will love them! I personally have always loved baking with my kids and when I learned my eldest son could no longer have gluten, dairy or eggs I thought our baking days were done. Not willing to give up and with the abundance of allergy free products, we have since created delicious cakes, pies and cookies that everyone can enjoy. This recipe has become a house favorite and when cut into heart shapes, makes the perfect gift for Valentine’s Day. It’s important to note that some allergies are so severe that contamination is as simple as a shared utensil. And, to be on the safe side, share the recipe’s ingredients. 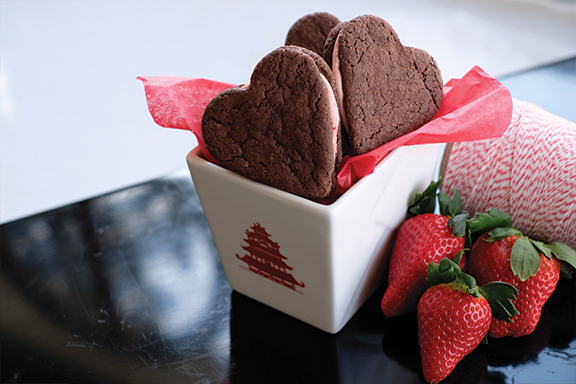 Then wrap them up in a to-go box with red ribbon and give them to the one you love! 2. Sift, flour, cocoa powder, baking soda and salt into a large mixing bowl and stir with a fork or shock to combine well. 3. In a separate bowl cream butter with a mixer until whipped and smooth. Add in the sugar and continue whipping until well combined and fluffy. Add vanilla and gradually add the non-dairy milk while continuing to whip the mixture until well combined. 4. Slowly begin adding the dry ingredients in the butter mixture until well combined with a spatula or wooden spoon. 5. Roll out dough between parchment paper until 1/4 of an inch thick. Use heart-shaped cookie cutter to cut out cookies and place on prepared baking sheets allowing a bit of space between cookies for spreading. 6. Bake for 6-8 minutes until cookies start to harden around the edges. Allow cookies to cool completely on baking sheets before frosting. 1. Mash strawberries and their liquid with a fork to a smooth consistency and place aside. 2. Place butter in mixing bowl and sift powdered sugar over butter. Using mixer beat the sugar and butter until well combined. While continuing to beat with the mixer, gradually add mashed strawberries. Beat until well combined and a smooth spreadable frosting achieved – it should not be dripping. If needed add a few drops of water or additional powdered sugar to get correct consistency. 1. Spread 1- 1 1/2 tsp of frosting onto the bottom of cookie. 2. Place another cookie on top and lightly press together. 3. If frosting starts to dry out, add a couple drops of water and stir to keep smooth. 4. Allow cookies to set at room temperature before storing between layers of parchment paper in a container.